While you make every effort to avoid getting cavities, sometimes it just happens. And when it does, your dentist fills it. Fillings, however, are most often not a permanent solution. Their lifespan depends on many factors. And when the filling does fail, it will need to be replaced to keep your tooth protected from new decay. Here are the signs it's time to call your dentist to have your filling replaced. Fillings are polished to a smooth finish so you don't notice them on a daily basis. If you notice a rough edge or simply something that doesn't feel right on a tooth that has previously had a filling, it may be a sign that the filling is damaged or even gone. Sensitivity to extreme temperatures, acidic, or spicy foods can indicate that your filling is gone. Without the filling, an entrance to the dentin layer (the space inside your tooth that houses hollow channels leading to the roots), leaves your tooth's roots exposed. It also means that bacteria can get inside. Pain in a tooth that has previously had a filling could be an indicator that the filling is broken, or gone altogether. This could mean that either food or bacteria has entered the space, and an infection is getting started. If something doesn't feel right with your teeth, it is important that you get to your dentist as soon as possible. A broken or lost filling leaves your tooth vulnerable to bacterial attack, which could then lead to further decay and an infection. If your tooth becomes infected, you will most likely need a root canal. Even if you don't suspect anything wrong with your teeth, it is still important to visit your dentist at least twice a year. 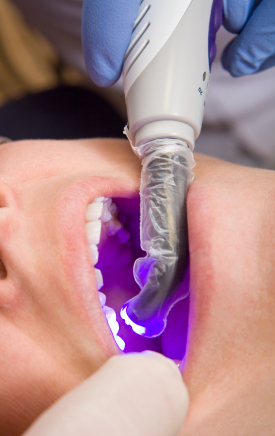 During these visits, your dentist will examine your teeth, and can monitor any fillings you have. And if any problems are noted, action can be taken before they become serious. If you are worried about one of your fillings, don't hesitate. Contact our office right away.